SAN MATEO, CA--(Marketwired - Apr 18, 2017) - SnapLogic, the leader in self-service integration, today announced industry-first technology that applies machine learning to enterprise integration -- dramatically changing the economics of cloud, analytics, and digital transformation initiatives. The new technology, named Iris, uses artificial intelligence to automate highly repetitive development tasks, eliminating integration backlogs that stifle most technology initiatives. Iris uses advanced algorithms to learn from millions of metadata elements and billions of data flows via the SnapLogic Enterprise Integration Cloud. It applies that learning to deliver expert step-by-step guidance, improving the speed and quality of integrations across data, applications, and business processes. The "self-driving" software thus shortens the learning curve for line-of-business users to manage their own data flows, while freeing up technology teams for higher-value design and deployment needs. "Digital transformation shouldn't depend on manual labor," said Gaurav Dhillon, founder and CEO of SnapLogic. "The ancient pharaohs built the pyramids with manual labor, but there's a better way to manage business automation and analytics. Starting today, the smart way to integrate data, applications and things will be autonomous -- blending the best of machine and human intelligence. The days of simply throwing more developers at the problem are coming to a close." Iris extends SnapLogic's vision for self-service integration, and will fuel a series of technology innovations that SnapLogic plans to deliver over the next two to three years based on its Enterprise Integration Cloud. The first Iris-based feature is SnapLogic Integration Assistant, a recommendation engine that uses machine intelligence to give business users and analysts the right next steps in building data pipelines. Integration Assistant will be available to customers next month as part of SnapLogic's Spring 2017 Release, and is available to all customers at no charge. "The SnapLogic platform allows us to seamlessly transfer data between systems, without cumbersome volume limitations," said Alan Leung, senior manager of data strategy and architecture at Box. "We're excited to begin leveraging the new machine learning capabilities to improve efficiencies, so we can integrate more data and automate more processes than ever before." The technology behind Iris was developed over the past two years by SnapLogic Labs, led by Dr. Greg Benson, SnapLogic's chief scientist and a professor at the University of San Francisco. Iris takes advantage of SnapLogic's unique cloud-native system and metadata architecture, allowing Iris to do the data science needed to find patterns and features that can be used to train machine learning models. Iris thus learns from data flows, integration paths, and patterns across SnapLogic's platform, determining what's popular, what works, and what doesn't work. It then translates that learning into specific recommendations for line-of-business and IT managers, so they can save time and reduce errors while applying best practices. "We're incredibly excited about the potential that machine learning has already shown to shortcut the integration process," said Benson. "We're seeing up to 90 percent accuracy so far on recommendations, which will save significant time and cost associated with building, testing, and maintaining integrations. Self-service is already driving major time and cost advantages, and we expect machine learning to power another order-of-magnitude improvement over the next few years." "Companies can't innovate and transform their businesses if they're bogged down in rote, repetitive tasks that don't do much for the organization," said Doug Henschen, vice president and principal analyst at Constellation Research. "Machine learning is emerging as the engine behind what Constellation calls human augmentation. These next-generation systems will harness the computing power and data scale of the cloud to automate routine work, so humans can concentrate on innovating and driving better business outcomes." "To keep up with the accelerating rate at which data and analytics are evolving, organizations need solutions that replace manual labor with automated intelligence," said Matthew Glickman, vice president of product management at Snowflake Computing. "SnapLogic's ability to deliver self-driving data integration, and Snowflake's automated optimization technologies, directly address that need. Using SnapLogic to easily and rapidly load data into Snowflake allows customers to quickly integrate and make use of their data, focusing on getting value from their data to deliver better business outcomes." 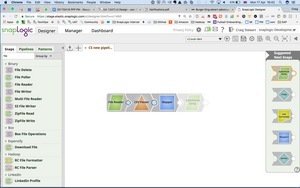 SnapLogic Integration Assistant is a recommendation engine that uses machine learning to predict the next step in building a data pipeline for cloud, analytics and digital initiatives. It is part of the “Iris” technology unveiled this week by SnapLogic -- the industry’s first software to apply artificial intelligence to enterprise integration.